Most tourist cars stream by the turnoff to Keanae, a quiet hamlet (near mile marker 17) that is set upon a penninsula of lava that spilled from Haleakala volcano. The center of "town" is a tiny stone church with a big name (ihi'ihioiehovanona Kaua) that dates from 1860. The recommended dining experience is Aunty Sandy's petite loaf of apple banana bread sold at the Keanae Landing Fruit Stand. Wave watching (white water bashes lava columns), kayaking, and swimming in two freshwater pools are among Keanae's attractons. Just before the turnoff to the village is Keanae Arboretum, with easy family trails alongside Pi'inau Stream, in the shade of huge trees brought here from both sides of the equator. Admission is free. Just after the Keanae turnoff is a second hamlet, Wailua, which sports two historic churches and taro field set below the green ramparts of the Ko'olau Forest Reserve. More to see on pages 112 through 113 in the Maui Trailblazer guidebook. On the short list of the koolest kats who have ever lived is Duke Kahanamoku—Olympic swimming champion (medaling in events from 1912 to 1924), surfing legend, and the ranking royalty on Waikiki Beach during the post-War golden years in the 1940s and 50s. Go to Duke’s Restaurant & Barefoot Bar at the Outrigger Waikiki and you’ll see walls of photos of the Duke with JFK, Will Rogers, John Wayne (wannabe Duke in Hawaii), Shirley Temple, Amelia Earhart, Ed Sullivan, and just about every celebrity from the period, along with other shots with his surfing buddies and calabash family of greater Honolulu. 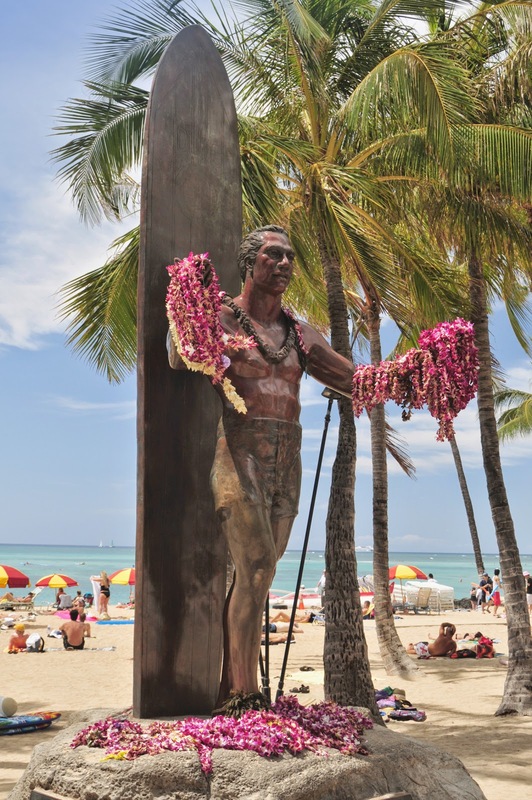 At Kuhio Beach Park in the heart of the hubbub is a bronze statue of the Duke, his muscular arms outstretched as a greeting of Aloha to all. Farther down the beach is the War Memorial Natatorium, a 100-meter pool encased by an Art Deco structure, built in his honor in 1927 as part of a bid for the Olympics. The games never came, but Duke and fellow swimming great Johnny (Tarzan) Weissmuller put on a show there. Drivers headed to or from the north shore on Kauai have many reasons to pull in at Kealia, which is near mile marker 10 just north of Kapa'a on the Coconut Coast (east shore). You won't have trouble spotting it: Look for a line of surfer mobiles and local cars mixed in with tourist convertables along a mile-long strip. On the agenda: Body-boarders love the rough-and-tumble shorebreak, which also draws spectators. One end of the beach has a protected cove for swimming. The long crescent of yellow sand attracts beachcombers and whale watchers. Cyclists pedal by on the long paved path that connects with colorful Kapa'a and extends another mile or three beyond Kealia to wild Donkey Beach (not reachable by car) as well as other hidden coves. Across the highway is the metropolis of Kealia, site of a weekend outdoor market and the beginning of a scenic backroad that climbs past Spalding Monument and then rejoins the highway at Anahola. Kealia is just the spot to add a little more aloha to a fun day on Kauai. 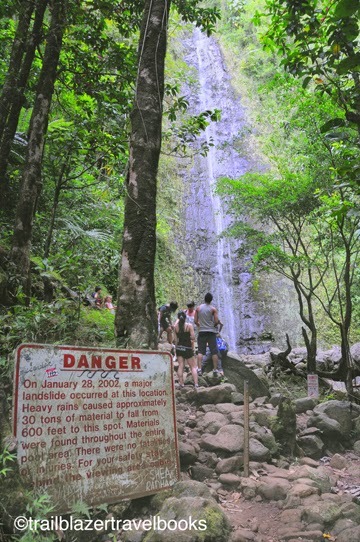 Not far from Waikiki, Manoa Falls Trail sees a lot of footprints, among them unsuspecting tourists who sign up with a tour guide and pay for an "adventure hike." Still, the 1.5-mile roundtrip jaunt climbs about 800 feet into the jungly Manoa Valley and delivers the goods for hikers looking for a quick getaway. The falls is a tropical classic, a 200-foot white ribbon tumbling down a cliff into a large pool. A parking fee of $5 is charged at the trailhead. If you go to Manoa Falls, be sure to also stop in at Lyon Arboretum, which is just up the hill before the falls trailhead. A spiderweb of trails cover the garden's 200 acres, which were planted nearly 100 years ago. The plantlife is truly astounding. The University of Hawaii took over in 1953. Also in the neighborhood is a short (2 miles roundtrip, 375 feet elevation) to Pu'u Pia, an extinct volcanic cone now covered with greeney that affords a view of Manoa Valley and the Ko'olau Range. Oahu Trailblazer has more details, beginning on page 79.